MobileMe&You – The most mobile conference. 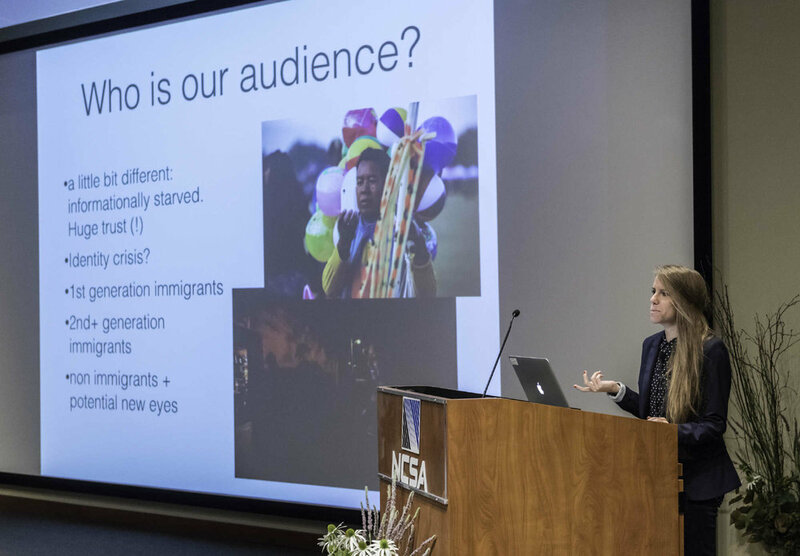 Using visuals as a shared language is an effective way to reach diverse audiences, Almudena Toral said. As head of feature video at Univision News Digital, Toral uses imagery to connect with both Spanish- and English-speaking audiences. Its audiences are comprised of multi-generation immigrants, non-immigrants and international users, she said. With so many different ages and backgrounds, deciding what languages and platforms are used is an important consideration in story forms. She also strives to play to each platform’s strengths by utilizing visuals in different ways. Unsurprisingly, video is a large part of this equation. Toral shared five ways to make effective video. Simple ideas and concepts. Keeping a narrow focus on a video helps make it more cohesive. Visual evidence. It’s easier to show and not tell when it comes to topics like the effects of plastic waste on albatross populations. The rare or incredibly visual. Toral cited Univision’s coverage of an alien festival in Argentina as an example. Action unfolding/drama/tension/surprise/change. Video has always been a natural fit for this more cinematic treatment of long-form storytelling, she said. Humor/tenderness/emotion/universal connections. This includes any human interest-oriented story that evokes emotion. In addition to video, Univision implements infographics, animation, illustration and more for various pieces. Animation can be used for anything from the humorous (a video about Trump’s comments against Latinos) to the serious (explainers on what to do in an ICE raid). Visit Univision’s portfolio to see more of its digital work. Aaron Smith, associate director of research on internet and technology issues at Pew Research Center, says mobile adoption in America has changed in the last couple of years. Americans nowadays prefer to use mobile devices and smartphones for accessing news as well as for e-commerce activities, according to Pew. “By mobile phone we see a huge increase in the overall share of Americans getting news on mobile applications,” Smith said during a presentation at MobileMe&You 2017. The study by Pew also showed that in terms of overall usage, the number of American adults who accessed news from mobile devices increased from 54 percent in 2013 to 85 percent in 2017. Meanwhile, the number of adults who read news from a desktop or laptop increased slightly from 82 percent in 2013 to 85 percent this year. “Now, mobile news usage is neck and neck with traditional desktop consumption,” Smith said. He added that there was also an increase in the number of people who prefer mobile devices to laptops or desktops for reading news. Based on his research, the share of Americans who preferred to access news using mobile devices rose from 56 percent in 2016 to 65 percent in 2017. The growing number of Americans who use mobile devices to search for news articles showed there was more mobile engagement from readers. Furthermore, Smith pointed out that mobile news readers were more interested in exploring long-form articles rather than shorter stories. “Per article basis, people engage more with long-form articles. On average, people that we examined spent 123 seconds on the long-form materials and 57 seconds on short-form articles,” he said. Smith also highlighted a shifting trend in consumer behavior in terms of mobile app usage. If in 2013 consumers were afraid to purchase things online, he said that’s certainly not the case this year. “Four or five years ago we got questions from reporters about why people were scared of buying things online. Now, the facts showed that people bought something online using their cellphones,” Smith said. The Pew study also showed that this year, people used mobile devices for a growing number of reasons, including for finding jobs, accessing online dating applications and reading electronic books. As much as 28 percent of Americans used their smartphones as part of a job search. Within this group, half used their smartphones to fill out job applications and create a resume. Meanwhile, 9 percent of Americans said that they used mobile dating applications, a three-fold increase since 2013. “Since the advent of mobile applications, young people were the most likely group to use online mobile dating apps,” Smith said. When it comes to reading on mobile, Smith said that 13 percent of Americans read electronic books in the last year on their mobile devices. The number, he added, was up from 5 percent in 2011. Smith said that the research center did a study on the role of mobile devices in American life because the center is also greatly impacted by trends in mobile adaptation. “Around 35 to 40 percent of our typical traffic in a month is on smartphones. So, I think it is a kind of significant that people are accessing our materials on smartphones,” Smith said. Judd Slivka, from the University of Missouri School of Journalism, spoke during the 2017 MobileMe&You conference about how to decide what gear newsrooms need to best equip mobile journalists. In this day and age, cell phone use in America is nearly 100% ubiquitous, and smart phone use isn’t far behind. Journalists are being told to use their phones to capture and tell the story. Newsrooms have to find a balance between making sure their reporters have the gear they need for their everyday assignments without going over budget. Mobile journalism can be economical if newsrooms purchase the correct equipment. When deciding on what gear to purchase, editors need to think about their use cases and their edge cases. A use case is what reporters are doing the majority of the time, and the edge case is what they are rarely doing. Newsrooms should fund equipment for their use cases rather then their edge cases. The typical use cases for a mobile journalist are correcting shaky cameras, gathering information on a mobile phone and composing it somewhere else, editing and publishing from the phone and adding value to stories. When purchasing equipment it’s best to start small, then work your way up. You don’t need to start with the best and most expensive equipment. Is your newsroom looking to create a mobile news app? Christopher Guess may be able to help with that. Guess is trying to help newsrooms build their own custom mobile app with all the bells and whistles one might come to expect. How does he plan to do this? With his own app development software tentatively called Push. Guess discussed his vision for Push during his presentation, “Mobile news app platforms for your small newsroom,” at this year’s MobileMe&You conference. Guess is well aware that many small to midsize newsrooms do not have the time or funding to build their own custom mobile app. Push is designed with that in mind to make the process as simple and efficient as possible. And Guess says that your newsroom will not have to sacrifice quality and functionality, as Push still offers an array of attractive features for prospective users, regardless of the size of their media operation. Newsrooms across the world are already using Push, like Meydan TV in Azerbaijan, and Guess hopes to reach many more. Before the end of his presentation Guess noted that one of the major obstacles Push is currently facing is censorship in many of the foreign newsrooms that employ the app. Not to be outdone, he's working on a fix for that as well. What is a smartphone without apps? No this is not a joke, this is real life. In the past 8 years, smartphones have become the norm. We look at them to add and subtract, read books, text our grandmothers and check when that new movie is playing. But for journalists they can be used for much more. Val Hoeppner of Val Hoeppner Media, or as she likes to call it, “CEO of Me,” gave a presentation at the 2017 MobileMe&You conference titled, “How to Work as a Mobile Journalist.” The presentation centered around apps that journalists can utilize on their phones in this mobile-led world. 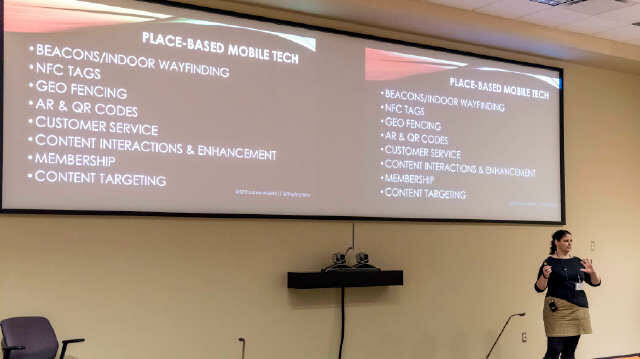 She told the audience, “If it doesn’t work on mobile, it doesn’t work.” This means that because we are in the age of the smartphone, it cannot be ignored, it should be utilized as effectively as possible. The focus should not stay on what we can do today, but what we can achieve tomorrow with the mini-computers we hold in our hands. 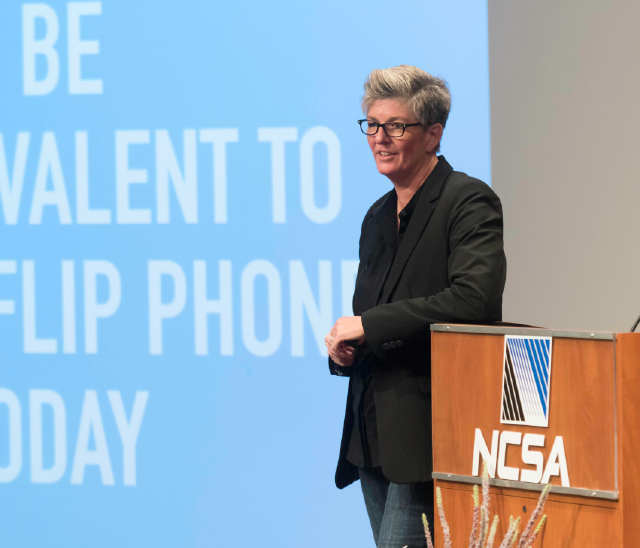 Journalists have to look toward the future because, as she mentioned, even the smartphones we use now will one day be the like the flip phones our grandparents use. · Movie Pro – This allows you to have a lot of control over your video. The app allows you to listen live to the sound you are recording. With audio being an important aspect of filming, video being able to plug in your headphones and listen can make your job easier in the end. The app costs $4.99. · iMovie – This multitrack editor is best on the iPhone. It is also a free app. · Textgrabber – You can scan documents, edit them digitally and copy and paste. It does digital text for courts and attorneys, and even translates between languages. It recognizes 60 languages and translates about 40. Cost is $7.99 – $9.99. · Canva – You can create mobile graphics and social media headers with this phone app. It also allows you to create your own geo filter and come up with custom templates. · Adobe Spark Video – Create video with text from mobile devices or your computer. You can also add voice-over in this easy to use, free app. · Reporters Committee First Aid App – You can navigate access issues concerning courts, public records and public meetings, download your state’s laws, or call their hotline and they will argue your case for free. It stays up-to-date with newly passed laws. Dan Pacheco believes in the power of experiential storytelling. 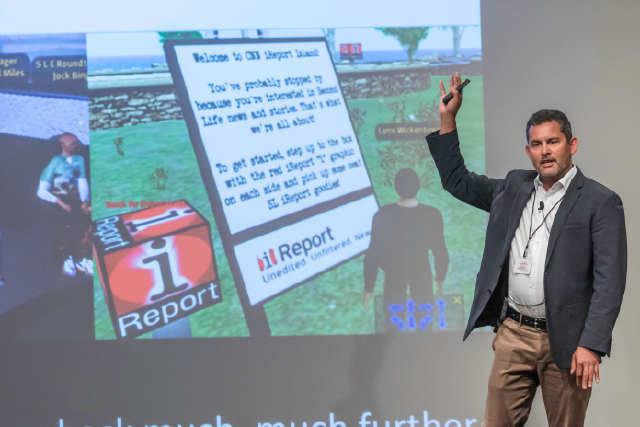 His presentation, “You Are There: Telling Stories with immersive technologies, including 360, VR, AR and full body haptic interactions,” introduced the MobileMe&You audience to his perspective on this emerging field of journalism. The presentation centered around Pacheco’s own personal experiences with experiential media and that of his students. Experience is the key word, as Pacheco considers experience to be one of the most attractive things about this new method of storytelling. “We often say, you had to be there, now we can say -- here, go there,” Pacheco said. “Going there” helps eliminate some of the distance from a story. In turn, the removal of distance allows the user to more readily engage with the content, and possibly builds or strengthens a sense of empathy in the process. The presentation also featured the work of several of Pacheco’s former students and colleagues in the industry. While he acknowledged that these technologies (VR and AR) still had a long way to go, he also championed the limitless potential of using experiential journalism, when done correctly and with improving technology. Pacheco also asked audience members questions in regards to the still-forming ethics of virtual and augmented reality, questions that likely have never been considered until now. Is it ok to digitally remove something from a shot? Can a journalist stage a shot? How does one handle an unintentional capture? All legitimate questions that now need be answered with a form of media that takes place in a 360 degree space. 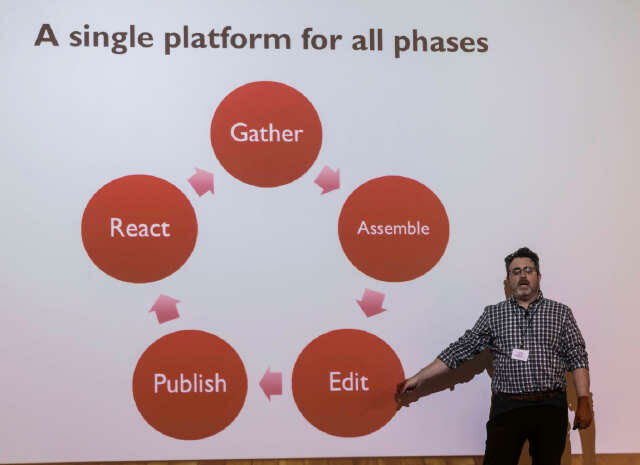 Pacheco referenced a lot of software and hardware throughout the presentation that journalists should consider, however, the presentation was novice friendly focused on the power of storytelling rather than technical mastery. Kurt Gessler, Deputy Digital Editor at the Chicago Tribune, presented about writing effective headlines for digital media at the 2017 MobileMe&You conference. The most important function of headlines is to retain and grow audience, which can be a huge stress on smaller newsrooms. Headlines operate very differently in print versus online. Print readers have more context to take in, including sub headlines, mugshots and drop heads. Readers take in the entire package as one unit. Online readers don’t have as much context when looking at a story. If an online story has a bad headline, people won’t click on it and read it. Specifics and numbers are good. Headlines should state the obvious while keeping your readership in mind. You shouldn’t assume that readers will “Get to the good stuff.” You should tease to the good stuff and encourage them to get there. Headlines should explain to readers why the story is important. Using proper nouns is important for local and regional publications because geography is core to the brand. Headlines should be frontloaded with critical words at the beginning. This will also help with SEO. However, passive voice can be much more effective if it reads faster. Headlines should strive for clarity first and should be a reliable source of information. 7) Is the author important? Some authors have strong followings and including their name in the headline will increase read time on their articles. Asking a critical question can help draw readers in. Tapping into an emotional response will also help draw readers in. Using puns conveys a light tone, which can be inappropriate for certain stories. 11) Have a great quote? Use it! A powerful quote can encourage readers to open the story. Headlines should be written how people talk in everyday life. What is the most important issue in a story? This is what readers need to know. Headlines should tell people why the article is important. Including too many things will make things messy and complicated. Gessler recommends knowing your audience and what is important to them. Knowing this information will allow newsrooms to monitor their articles and adjust headlines as needed. He used the Cubs as an example, which is important to the readers of the Chicago Tribune. If the paper publishes a story about the Cubs online that isn’t doing well, they will look at the headline and change it. Adjusting the headline can increase clicks and read time on the story. Increasing clicks and read time doesn’t always require deep technical knowledge or expensive web tools. Since native apps’ inception, many publishers have considered them the solution to their problems. 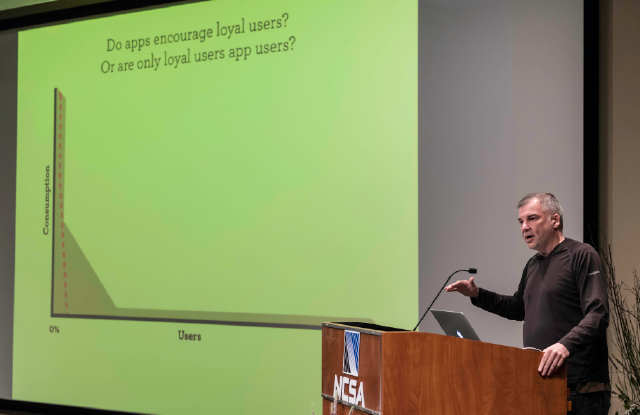 Aron Pilhofer of Temple University quashed what he called “app-thusiasm” in his presentation, arguing that apps are only effective when publishers understand the “why” behind them. Pilhofer argued that standard news apps aren’t worth building for four main reasons. 1. News apps usually don’t create loyalty. This idea doesn’t hold water considering that most app downloaders already are loyal users, he said. In addition, most downloaded apps are only used once. 2. News apps make up only 3% of users’ total app time. While users spend a full 50% of time on mobile apps, getting users to actually download and spend time on apps is another matter entirely, he said. On average, users download zero apps per month and only use one to three apps. Furthermore, news and information apps aren’t in the top 150 most popular. 3. News apps don’t have much of an advantage when it comes to reader experience anymore. A few years ago, apps could deliver a more immersive experience than desktop. The New York Times’ “Snow Fall” in 2013 proved that you don’t need an app for that. And web browsers are quickly catching up when it comes to innovative features. Companies like Google have been pushing for ways to make web browsers more similar to mobile apps. 4. News apps are a luxury item. Developing apps is a much more specialized skill and takes more money to make. This is obvious when comparing developers’ salaries: front-end coders make about $50,000 per year, while iOS/Android developers make about $80,000 per year. While news apps don’t make sense in many situations, he said, they work well if the publisher has a specific reason behind the app. For example, Quartz has a news app that delivers news through text-messaging bots. This app works because it provides a unique experience and fits into the company’s larger AI-focused strategy. Susan Poulton, Chief Digital Officer at The Franklin Institute, presented “Mobile Devices and Cultural Institutions,” at this year’s MobileMe&You conference. Poulton discussed the variety of ways The Franklin Institute, located in Philadelphia, Pennsylvania, uses digital media to to curate content in the museum and beyond. Poulton emphasized the need for museums to evolve alongside digital technology. “Audiences are going to start expecting more from a museum, they are going to want interactivity, and where do you find that? On a phone,” Poulton said. She offered insights as to what this “interactivity” may look like in the future. Examples included virtual and augmented reality, GEO-fencing, NFC tags and more -- all of which are already implemented at The Franklin Institute or actively being discussed. Poulton also mentioned some of the challenges museums must face in order to move forward into the digital space -- most notably a hesitance to change. The thought that a phone is too distracting or that no one downloads museums’ apps on their phone are notions that may soon be dispelled. Poulton contends that digital media is instead a tool that should be leveraged to enhance the experience of museum patrons and employees alike. Things like membership, discounts, maps and bathroom directions can all be stored on a phone app, but why not dive further? Imagine yourself at your favorite exhibition; now imagine if you had the ability to step into that world with the power of virtual reality. The Franklin Institute is acting on that thought as it recently implemented virtual reality karts, a portable VR station that is placed near a physical exhibit to supplement the display piece in one way or another. This approach to using mobile in place-based destinations (specific digital interaction features in a designated space) may help explain why The Franklin Institute is the ninth most liked museum on Facebook. The Franklin Institute’s recent accomplishments in the digital space include the launch of a new mobile app, creation of a virtual and augmented infrastructure and video content that features information on employees. Consider checking out The Franklin Institute’s AR Terracotta feature here if you’d like to see some of their work in action. Thumb-stopping content is key in an environment where most audiences are getting news through phones, CNN Worldwide’s Ashley Codianni said. 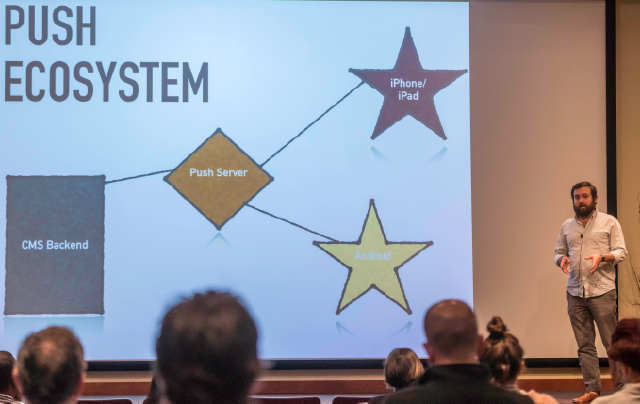 In her presentation, she shared her team’s strategies for using platforms like Snapchat and Kik to delve into stories and connect with audiences. This is increasingly important in CNN’s newsroom, where 80 percent of its content is accessed on mobile. As CNN Worldwide’s Senior Director of Social Media, Codianni manages a 24/7 publishing team of 21 journalists and producers. Her job revolves around leveraging social platforms to give CNN’s stories more impact. Tailoring content based on each platform’s strengths and main audiences is at the core of mobile-first storytelling, Codianni said. For example, in a piece about refugees crossing the Mediterranean Sea, her team made a “build your own adventure” experience on Facebook Messenger and published vignettes on Instagram Stories following the boat’s journey. This content allowed audiences to connect with the story in unique and compelling ways. Social apps also allow reporters across the globe to quickly disseminate information. CNN’s Will Ripley uses Snapchat, Instagram Stories and Facebook Live to share breaking news from North Korea with audiences. “We have reporters all over the world, and I want to make sure we’re taking advantage of that,” Codianni said. Navigating ever-changing platforms is no easy task, Codianni acknowledged. It hasn’t even always been easy for CNN reporters. She said three years ago, it would have been strange to see a journalist gather Snapchat content — but now it’s a part of the workflow. It’s all about finding a balance and establishing priorities, Codianni said. But she also underscored the increasing significance of using social apps for news. Social platforms allow journalists to brand themselves and their organization while connecting with audiences moment by moment, she said. 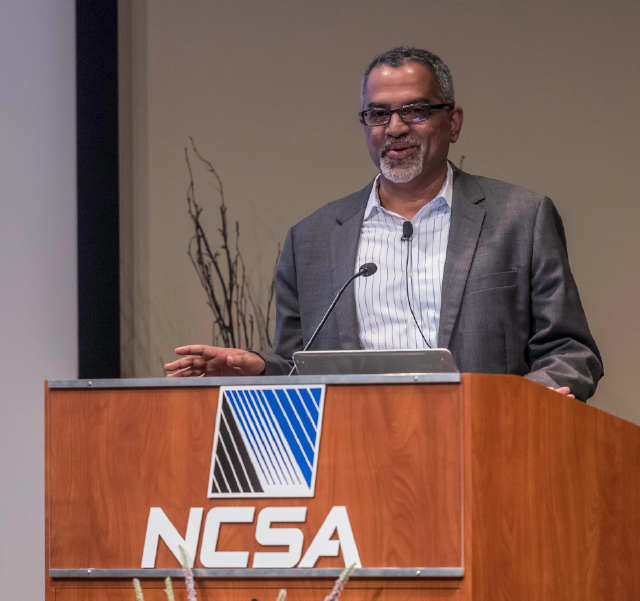 Raju Narisetti, CEO of Gizmodo Media Group, shared his insights about how to lead, and become financially sustainable, in the competitive digital news industry. He said one strategy is for news outlets to collaborate with telecommunications companies, such as Verizon or AT&T, to get more people to pay for journalism products. “I can actually see a scenario where I am a Verizon subscriber. I have internet and all of that at home. If I get a note from Verizon in my monthly bill saying, ‘Hey for a dollar or more in your bill, here all these amazing brands plus some exclusive things would you want it?’ I would say yes,” he said. This new payment ecosystem, he added, would lift some of the burden on media companies in their struggle for subscriptions. But he said that media companies would need to think about subscription fees if they want to expand or reach international audiences. He gave an example of how a few dollars added on a digital subscription fee would be quite expensive for people living in other countries. Narisetti also believes that journalists should think more about how to bring their stories to more readers. “Our industry often fails and struggles at what I called an intersection,” he said, adding that he wished news organizations would adapt more to allow the intersection of the newsroom and business side to thrive and encourage sustainable journalism. Next, he pointed out that to be sustainable and to win the attention of readers in the digital world, media companies should not forget to keep the core values of journalism in order to produce meaningful storytelling. “If you have enduring journalism and if you have strong storytelling, then your brand will be on the top of mind. That is how you can continue on winning this battle,” he said. During the session, Narisetti advised young journalists not to focus solely on technological tools, but also to grow their curiosity in creating stories. “Tools and all of that are great if you know how to do them, but if you don’t have the essential curiosity about looking into something and saying,' I wonder why this is the way it is and translates it into a story, video, or podcast, then it is nothing,” he said. Prior to his job at the Gizmodo Media Group, Narisetti worked as the Senior Vice President of Strategy at News Corp, was Managing Editor of the Wall Street Journal Digital Network, and was Managing Editor of the Washington Post. Gizmodo Media Group is a part of Univision Communications. Its readership is primarily young Americans in their 20s and 30s. 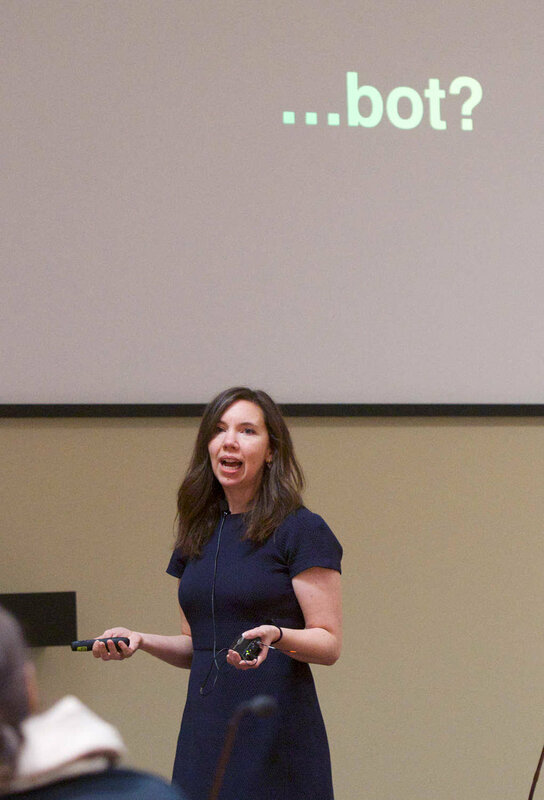 Emily Withrow, editor of Quartz Bot Studio, presented about the intersection of artificial intelligence and our everyday lives during the 2017 Mobile Me & You conference at the University of Illinois Urbana – Champaign. A bot is something that automates a process for users and provides information. Google Home and Amazon’s Alexa are both two of the most well known examples of bots. Withrow uses a variety of bots in her everyday life. She uses an assistant bot named Andrew Ingram that schedules all her meetings and has access to her schedule. The bot is able to learn from its interactions with Withrow to serve her better. It can pick up on the tone of her emails and gage the formality of the relationship she has with that individual. She also uses a bot that provides ideas for outfits through Facebook Messenger. There are three different types of bots: bots that push, pull and both. A push bot sends information out to users, such as pushing inspirational quotes via Twitter or Facebook Messenger. The bot pulls the information from a database and sends it to users. A pull bot collects information and sends it to users. This type of bot searchers websites and collects information based on what the user is asking. A bot that pushes and pulls allows users to have an extended interaction with the bot. Bots are helpful for companies because they allow brands to interact with their audience where they are. Typically, an organization will try to pull consumers from social media to their website. A bot, when integrated with Facebook or Twitter, enables companies to interact with their audience without pulling them away from the platform they are using. Regardless of the type of bot, however, Withrow says it’s essential that the information they provide be interesting, important, and useful. “Bots need to do something for your audience so they will interact with you,” Withrow said. Bots also allow brands to tailor the content to the person they are interacting with, like the Midwife Bot, which provides information to women during pregnancy. Users can ask the bot, “Can I eat sushi?” and the bot will respond, “No.” This interaction feels more private to the user than searching Google. Bots can even be programmed to have a voice and personality. Withrow spent a considerable amount of time interacting with bots and found that she preferred those with a persona rather than a brand logo. Stay tuned as this year's conference gets underway Oct. 20! Recaps, highlights and insights from speaker presentations on the latest in mobile journalism, audience engagement and emerging storytelling technology will be posted here. You can view a schedule of this year's event along with links to livestream presentations on the schedule page. And don't forget to join the conversation on social media by following @MobileMeYou and using #MMY17.